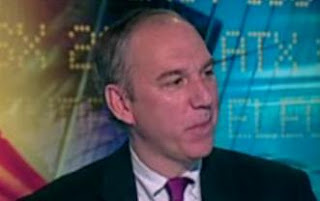 Charles Ortel, managing director of Newport Value Partners, tells Accuracy in Media in an exclusive interview that the Federal Reserve plan to buy $600 billion of U.S. Government securities "borders on the criminal" because the impact will be the devaluation of the dollar by 20 percent and the destruction of $10 trillion of household net worth. "Any potential benefit to GDP and incomes [from the Fed's action] pales in comparison to the wealth loss (in real terms) and to the damage done to foreign investor confidence," Ortel says. Ortel, who has been critical of U.S. economic and monetary policy under President Obama, fears that "investors will run faster from the dollar and we may soon experience the sizeable pain that comes when foreign capital rushes for the door." Ortel has publicly warned that the Obama Administration has been pursuing what amounts to "destructive" policies that endanger the American capitalist system through rising levels of government debt and spending. On CNBC, he first warned in May 2009 that the administration seems to be waging a "war on capitalism." In February of this year he warned that there is a very real risk of a U.S. default on a total debt of over $50 trillion. With the Fed's new move, the "war on capitalism" has become an even more debilitating "war on wealth," he says. The latest Fed action was announced on November 3, after Americans believed they had registered their electoral protests against a growing and intrusive federal government. The Federal Reserve said a massive $600 billion "stimulus" for the economy would take place in the form of expanding the Fed's "holdings of securities." The announcement was put forward in a press statement from the Board of Governors of the Federal Reserve System. The Fed's new action, labeled "quantitative easing" or QE2, follows a first attempt at "QE" that certainly does not seem to have been effective, judging apparent results. All "QE" means is that the Federal Reserve is printing more money and buying more government debt. In total, according to Investor's Business Daily, "the Fed will have created $2.5 trillion out of the blue." Despite the press release about the decision, Fed Chairman Ben S. Bernanke explained his reasoning in a column for the November 4 Washington Post, saying the Fed has a "particular obligation to help promote increased employment and sustain price stability." But the Post and other media were slow to question this move and examine its dangerous ramifications. "Investors cheer new Fed action," the Post proclaimed in a front page headline on November 5, with a smaller headline about "some Republicans" such as Rep. Tom Price and Senator-elect Rand Paul objecting to what Bernanke is doing. "Quantitative easing is a fancy way of saying that the money in Americans' pockets is about to buy a lot fewer groceries, clothes, and gasoline. Printing $600 billion of new currency does not make us $600 billion richer. It does not create jobs or prosperity. It simply makes Americans' savings less valuable while laying the foundation for future asset bubbles and crises. "Printing hundreds of billions of dollars is a risky gamble by the Fed. Voters just handed a staggering defeat to the idea that Washington should have more control over the distribution and value of Americans' money. They clearly want a more limited and responsible government that will remove barriers to job creation instead of speculative economic engineering." While the Fed's action garnered stories and headlines across the country, the fact that one member of the Federal Open Market Committee of the Federal Reserve system had voted against the policy was buried in or ignored by most news stories. The press statement from the Fed noted that, "Voting against the policy was Thomas M. Hoenig. Mr. Hoenig believed the risks of additional securities purchases outweighed the benefits. Mr. Hoenig also was concerned that this continued high level of monetary accommodation increased the risks of future financial imbalances and, over time, would cause an increase in long-term inflation expectations that could destabilize the economy." "I definitely think the Fed (and all central banks) should be required to prepare meaningfully incisive, timely statements of their financial condition (as should all government entities and any corporation that issues securities)." It is time, he says, to have a rigorous and comprehensive look at the balance sheet of the Federal Reserve. "The last time I checked," Ortel explains, "the consolidated financial statements for the Fed system showed scant equity and assets of less than Triple A caliber. The accounting standards employed by the Fed are hardly strict, so these statements are far from reassuring." Ortel called for "Trust but Verify" reporting on the operations of the Fed. Regarding the new QE2 actions, Ortel says that he would love to see the legal and financial analysis supporting these actions, "especially the work done to consider downside scenarios." In terms of the impact on ordinary Americas, who are somehow supposed to benefit from the Fed's actions, Ortel explains how and why the injection of $600 billion into the economy can backfire and result in even more problems down the road. "According to the Federal Reserve itself, household net worth in the U.S. is about $52 trillion. In contrast, GDP is just $14 trillion and GDP is akin to gross revenues. The amount that trickles down annually to household wealth is less than 10 percent of GDP. Call it $800 billion this year for talking purposes. "Devaluing the dollar, which is the direct consequence of QE2 by 20 percent (Bill Gross of PIMCO has this estimate) immediately knocks $10 trillion off of household net worth which borders on the criminal. Any potential benefit to GDP and incomes pales in comparison to the wealth loss (in real terms) and to the damage surely done to foreign investor confidence." "Resorting to another round of QE tells the world plainly that the Fed is out of effective ammunition and is simply grasping at straws." Ortel predicts a "coming shakeout" and a new global regulatory regime that will emerge "after a great deal of financial (and I hope not real) blood has been shed."